Marcus Bell is a Triple Master of Photography (Awarded by Australian Institute of Professional Photography, AIPP. ) and Creative Director and Principal Photographer of Australia’s number one photography studio “Studio Impressions”. Marcus has been named in the top 10 Wedding photographers in the world by BBC Television, is the author of “Master’s Guide to Wedding Photography” published by Amherst Media NY in 2006 and is currently in the top ten photography best seller list. Marcus’ images have been published in more than 30 books in 50 countries, and he has been featured in three photography documentaries, as well as many magazine front covers. Marcus was the keynote speaker at WPPI annual convention that attracts over 10,000 attendees in April 2006 and 2007 and then again in 2009 received a standing ovation from his keynote talk in Las Vegas, USA. 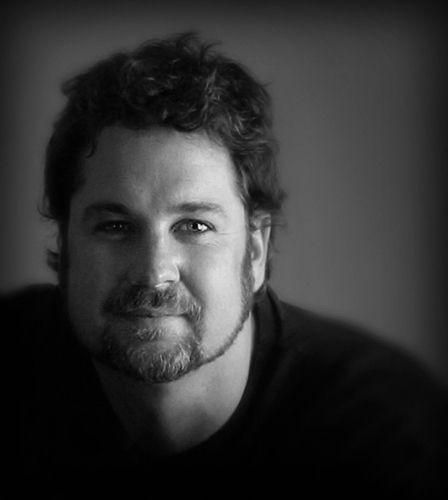 He has conducted seminars and workshops in the USA, Japan, Canada, England, France, Brazil, Wales, Ireland, Scotland and New Zealand and is recognized around the world as an authority on Photography, digital workflow development and Master printing techniques. In 2006 Marcus was invited to be a part of both the prestigious Adobe Ambassador team, one of only three in Australia and as an Epson Ambassador. In 2009 joined the Nikon Ambassador team at its inception of the program. Over the past 10 years Marcus has continuously been awarded the highest accolades in the industry both nationally and internationally. Showing his ability to constantly reach new levels year to year and to continue to be at the forefront of his craft. I had the pleasure of attending Marcus’ lecture at WPPI 2010 in Las Vegas, where he gave a very moving presentation of a wide range of his work—from wedding photography to documentary. I looked further into his work, and then many months later invited him to do an interview for photo.net, to share some of his insight and inspiration with us. Thanks Marcus! Marcus Bell’s Real Life Wedding Moment Contest: We hosted a wedding photography contest judged by Marcus Bell. It ran from October 18 through November 1, 2010. The winner received the Marcus Bell Master Collection effects and actions (value: $695USD). View the winning entry and honorable mentions: Marcus Bell’s Real Life Wedding Moment Contest. How would you describe your general style? I’m inspired by real-life events, especially on a wedding day. I might see something and there will be two reasons why: it’s beautiful scene, and I can relate to the moment personally in some way. It’s an extension of who I am to be able to identify those special moments. The couple may not even realize till later when they see the photos what moments were captured. My style is about capturing the real life of people and settings. It’s very reality-driven. I love capturing the beauty in life. A lot of photographers in Australia don’t really photograph the reception of the wedding. For me, that’s when so many of these amazing moments of people sharing their lives quite openly. There’s this flood of information about these people’s lives that I get privileged to witness and I’m able to encapsulate those stories for those clients forever. Would you say you follow the stories around more so than the light? The number one priority in any amazing photograph: find that moment first, the impact. Once you have that, then you can look at light, composition and all the other things. You can have the most beautifully lit image but if it doesn’t have any soul, no impact, you won’t retain the viewer to look at it. The moment transforms everything else. Of course, if you have poor photography skills—it’s going to show. There are rules to it, but for me, the impact is first. You seem to utilize soft focusing to draw attention to a certain part of the image—is that something you’ve developed as part of your style? One of the things that hit me early on, you have to know as a photographer what you want to say—too many photographers don’t have anything to say. That’s always stayed with me. Whenever I’m taking an image, I’m thinking about the tools that will help me to communicate the message. Considering those areas of focus and out of focus and the area within the frame help with the composition. I’ve always been one to use very large apertures, f/1.4, f/2, and shoot wide open a lot. In the past 2-3 years, I’ve been extending that vision through tilt-shift lenses, throwing areas of the frame out of focus. When I first started with photography, I was so attracted to black and white because it disguised all the info that we don’t need in the image and made a beautiful image more simple. Through understanding and learning a lot more about art and what painters do, I also think more about producing a work of art. It’s important to understand the tools. As photographers, we can be limited because we look at the back of the camera and we feel like we have to take that as gospel, whereas a painter starts with a blank canvas and then actually makes decisive decisions on space usage, color, elements to include, and so forth to really communicate. There are so many complexities and processes to make a painting really simple. Some people look at a simple image and think it’s amazing. They think it’s easy to create. Simple images are probably the most difficult to create. Preparing for a wedding, do you see it as a blank canvas, where settings will work best. How do you start to paint your canvas when preparing for a wedding? I see myself on a wedding day as two photographers. One is a documentary photographer who is very much like Jeff Ascough. The other is as a portrait photographer, quite documentary in style, I guess you could say documentary portraiture. I will see a scene and know where to place the subjects in the scene. I don’t want to give them too much structure and want to allow them to be themselves. I want to make sure the light is beautiful, the composition is perfect as I still have a lot of hand in it. When I capture the moment, I allow them to be themselves, to be relaxed, be within their own conversation. As far as how I prepare myself, hours before the wedding or a day before, I’ll go to the location I’ll be shooting and look for scenes that could stand out and act as amazing backdrops. I mentally prepare my mind for all the opportunities that may come my way, all the possible events that will happen. I might take actual photographs and then put together little diagrams of where the people should be using different lighting. I do prep a lot before the wedding to make sure I will be capturing the event perfectly. Have you ever had a wedding where you absolutely did not like the setting and had to work really hard to find good backdrops? Interesting question. As a wedding photographer you don’t get a choice. I don’t see it as a problem. That’s what makes a great wedding photographer. You have to go in to any environment and make that environment sparkle no matter what—you don’t get a second opportunity. You take the ordinary and make it extraordinary. It’s about what you leave out. Simple lines, simple lighting. The tools I’ve been training myself in, for the past 12 years or so, I’ve always been known for available light. In the past 8-9 months, I’ve been using more studio lighting on location with combinations of a Profoto B600 batterypack and a couple of speedlights. What I can create with that lighting setup anywhere is pretty remarkable. It’s taken things to a whole new level for me. That’s only maybe 10-15% of the day during the portrait time. Still even during that time, I’ll approach it with a documentary style and capture the moments as they’re happening. I have a concept in mind of creating an image for the wedding couple, bringing in a third element. 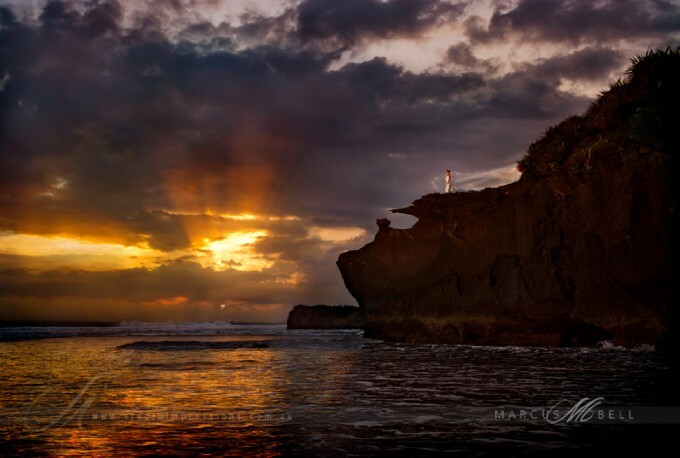 The wedding I did in Bali, I had an idea to have the bride on a cliff at sunset with some really dark clouds behind her. I arranged for a lighting assistant to come with me. 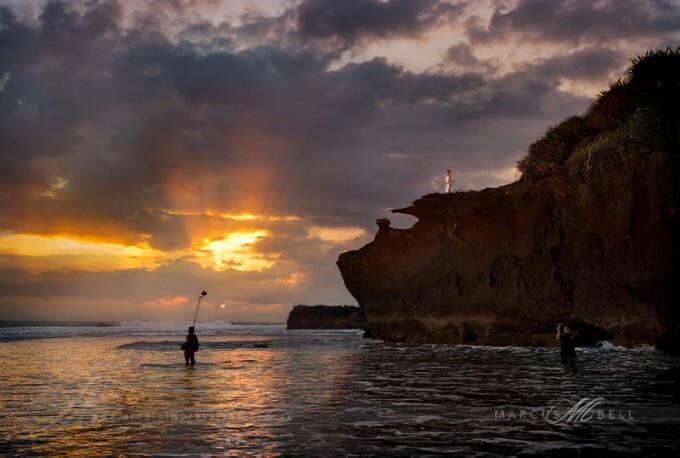 He’s standing in waist deep water with a Profoto light, lighting the bride on top of the cliff. Now I’m starting to think more artistically and designing an image to provide my client as well. It’s giving me more distinction for my clients. Not all clients are creative. Not all perform well in front of a camera. How do you manage your clients’ expectations and/or encourage them to think outside the box to work with you? I only advertise and put images on the web that relate to exactly what I do. When someone contacts me, I’m already perfect for the job. They’ve fallen in love with those images. I can’t get it wrong. I also have a couple of different skill sets for me to cover all my bases. In a hectic environment with not a lot of time, I’m able to resort to my documentary style. In a limited stretch of time, I could capture these most amazing moments. One of the things that photographers around the world contact me and talk to me about, they say that they’re amazed at how I see these moments at every wedding I go to. I’ve had photographers come along with me on a wedding and standing right next to me as these most amazing moments are occurring. Even though they’re witnessing them, they never identify them in the moment to actually capture those moments themselves. They kick themselves later and say “I was standing right beside you and just didn’t see that happen.” It gives me a lot of peace of mind because I know that even in the most strenuous moments at a wedding that I can actually perform at my best and get an array of really wonderful images that are going to connect with the client. That’s I think the most important thing. When the global financial crisis (GFC) happened about 18 months ago, clients were definitely cutting back on images to include in their albums, but what they were cutting back on were the more structured posed images. When it came to the real moments, because they had an immense connection to those images, they were priceless to them. They would never cut them out of the album. That was a real important understanding for me with my clients. It comes back to those moments I want to capture. I get clients coming in referring to, “Oh, I saw this shot of yours of an old man. I’ve got one grandparent remaining and that’s why I want you to shoot my wedding because I want that relationship captured forever.” Because of my documentary style, I can capture these moments easily so therefore there’s little pressure on me. I can relax and have a great time and really enjoy what I love doing. What is in your photography kit? I always have 2 cameras on me, one hanging on each shoulder, hence using the up-straps. Always the 24-70 on one body and on the other, will alternate among the 70-200, 85/1.4, 50/1.4 and the 45 tilt-shift lenses. If I had to, I could easily shoot the whole wedding with the 24-70 because I like mingle nice and close to the wedding party. I also love to shoot wide and leave more of what’s happening around me rather than shooting too tight. I prefer to keep everything on me at all times. The extra lenses I keep in Shoot Sacs around my waist. I don’t need a camera bag or an assistant or anyone else around me to handle my gear. Another tip: I reverse my cameras so the lenses stick behind my back with the lenses facing down my legs rather than out. When I’m standing there waiting, it looks like I don’t have any cameras at all on me. I found that looking not like a photographer to capture great moments is really important. I also have a separate lighting kit. I won’t have it with me at all times. For some weddings, I bring an assistant just for the lighting portion of the shoot. My focus is to use beautiful studio light on location. Even during this portion, I find it important to remain unobtrusive and stay in my available light zone. When the opportunity arises on location with a couple, the clients love seeing studio lighting on location. Rather than having a tiny little softbox and an SB900, what I think I’m better off having is a great big super softbox you would normally use in the studio. Once you have an assistant to help with setup, it doesn’t really make a difference. I’ll use the Profoto beauty dish on location as well, use some diffusers on the SB900s, I also have a fantastic studio 4AMP portable battery pack. What tips can you offer on how you focus and meter? I used to always shoot in manual, but ever since shooting a project in Brazil with 2 other great photographers, I’ve learned to use Av (aperture priority) mode a lot. I’m using aperture priority mode—zoom lenses at 2.8. Using the Auto ISO setting, I can set my camera up to have a minimum shutter speed I want to work with to make sure that everything’s in focus. Sometimes I want to show movement. I use shutter priority already set up around a 1/15 or 1/20s. For the wedding day, I set it between Av, which I will use most of the day, then I’ll shoot with shutter priority so I can show movement and then I’ll go into manual mode and turn auto ISO off. I customize my camera so I can easily toggle back and forth amongst these 3 modes. I have the EV exposure compensation on as well, so all day I’m continuously adjusting my exposure. If I have a really dark subject against a dark background, I know that I have to underexpose that, bring that down a stop and a half. If I have a bride or a really white subject, I will have to overexpose at least one stop. I’m consistently using that exposure compensation, which on Nikon you have to manually set it up, when I used Canon, on their cameras it’s already set up. I mainly rely on autofocus. For metering, I also leave it on auto. From my film days, I understand about exposing for the background and foreground, understanding how the camera meters work. I’ve always understood how to compensate for translating what I’m seeing in actuality and capturing it the way I want to with the camera. I am really in tune to adjusting my exposure on the fly so it’s pretty accurate most of the time. Wherever I can, at the reception or on location where everything’s set and there are less variables, I feel very comfortable going into manual mode. One of the reasons for working in aperture priority, I can work in 3 different areas of the church with different lighting, my images will have consistent settings. Once I’m in an area with consistency throughout, I prefer to work in a manual setup. Explain your workflow, including presets. About 8 years ago, we first started getting into digital photography. We started by getting our film digitally scanned. Having creative control over the developing was such an amazing tool because our work just looked so fantastic. The only problem was we were spending 4-5 days a week preparing images to show clients. We worked out the backend of actions and processes and refined these from year to year. We have 2 special things we’ve designed in our studio. One is the presets, manipulating the raw data from a creative angle to give new and exciting looks to our images. We’ve also got a quickflow processing system so we can save each file 13 different ways. We reproduce that image for every application that we with will be possible that image will be used. That includes a hi-rez version for an album print, an image for FB, blog image, to burn to DVD—every one of those file formats wants different pixel ratios, color profiling, etc. We created a workflow situation and a script that allows us to produce all those files at once. Over the last 8 years, we’ve progressively taken our workflow from working 4 days on a wedding down to a matter of hours. We can process 800 images and have it all proofed within an hour and a half at spectacular quality. We’re happy to share that with photographers. That’s been a big differentiator in our business on a number of levels. Providing clients with the option of showing them high-quality work means that it does increase your sales because you’re showing them the real product that you want to show them, but also bringing the time frames down means more time to spend with your clients rather than in front of a computer. Marketing these days is so much more important than anything else. Of course, the photography we produce is still important, but if we’re just spending all of our time doing that, blogging, etc, we’re going to head backwards with our business very quickly. It’s a passion of mine to see photographers succeed in every way that they can. We established our photographer resources section of our business on our website: www.marcusbell.com and started selling our actions and our workplace solutions so photographers can take advantage of those. In the next month, we’re going to feature some new apps as well. We call them Instant Effects. Adding video to photography, is that augmenting or distracting in your production? It’s definitely a different head space to create video content. I try not to do both at the same time. If video is one of the services you’re offering, you really do need an additional person to handle that aspect, and one person concentrating on stills. Maybe at times there is some overlap, but I do believe it’s more of a 2-person team rather than one person concentrating on both. You’ll fall short in both areas. As far as the future of that goes, it’s very exciting. We did market research about 3-4 years ago and found that the average client gets married between 27 and 37. What we wanted to predict was in 5 years, the people who are 22 now, what are they going to want as far as a product, because they live in a different world. Therefore, one of the things that pop up, is more of a multimedia process being part of what we offer. We saw this about 4 years ago becoming the trend so we’ve been offering those services for about 4 years now, making sure we’re aggressive with new technology. There is a large influx of photographers coming into the marketplace, which I think is great. Photography is becoming more and more popular. One of the downfalls is newer photographers don’t consider how much time it actually takes to capture a wedding. It’s not just the day of, there’s another 40-50 hours (of post-processing and prep) involved. A lot of photographers don’t account for all the additional time involved for shooting weddings when they’re pricing their work. Understanding the cost of sale and producing a wedding is really important for wedding photographers to account for. The one thing I would hate for new photographers is to get into it for a year and then fail because they didn’t have the foresight or understanding of what all is involved in this environment. If you have the passion for it, it’s great to see people succeed. You have so many different aspects to your business. How do you manage your success? I guess I’m kind of a workaholic. It really is a passion. I really do love every aspect of it, and am always so inspired, learning new things all the time. It’s never boring or dull. I still photograph 50 weddings a year, still get out and speak as well. Ultimately, what I love most about what I do is the photography. Doing the speaking and other aspects of the business, I’m learning more about me, business and marketing as I go. I think those go hand in hand. I’m always challenging myself to learn new things. Everything feeds itself now. By doing all the other things, I think my business and my photography is always better for it because I’m always fresh and always learning. When I’m preparing for speaking and research successful people, one of the most common things I find amongst successful people (billionaires, CEOs, etc.) they have a passion for what they do. They follow their dreams. As a result, because they’re passionate about it, they work hard at it but don’t feel like it’s work. It’s never a 40 hr/week job for them—they’re in a totally different mindset. There are no restrictions, you just grow continually, always striving for more, setting yourself goals and working towards something, that you have a defined space that you’re heading towards and working within. Tell us a little about your business plan when you were just starting out. The common thing, everyone said when I was starting out about 12 years ago, it’s not going to last. There’s no way you’re going to have a successful business because you have to be more of a business person rather than a photographer. That drove me to be more passionate about making it happen and making a difference. You really do have to be good at doing business. I spent 5 years in the banking world before switching over to photography. I do think those 5 years gave me a good base and understanding of finances and money. I’m not saying I was good at that, but it did give me some head smarts. To be successful, it’s a lot more than having a camera and taking some really nice pictures. I didn’t want to be a starving artist. I wanted to be creative in what I did and as good as I could be, while having a successful business as a result. I base my key values on what I love to do, I strategize and think clearly about what is in it to make it for me as well. I do know that now after doing it for 12 years, I know it’s possible, and it’s following my passions. It’s a return on your investment—the more you put in, the more you’ll get back. In the early years, when I did work 80-100 hours a week to get where I am today, I had to concentrate on so many aspects of my business, the photography for my clients, the marketing, etc. If anyone wants to be successful they can certainly make it, but you just have to have the passion to do it. If you’ve lost that passion, you have to find it, or you may as well do something else with your life. Life is too short. You have a team of other photographers. How did you select them? Personality and their understanding of the importance of weddings. Every wedding photographer is different and every client is different. Not every client wants what we have and what we offer. When I started out, I was very into Henri Cartier Bresson, Elliot Erwitt, Magnum photographers, into a documentary style and I saw that as a great opportunity for wedding photography. Amazing portrait photographers or celebrity photographers around the world, bring a fashion element to wedding photography. Having something different and being different is really important. Be inspired by other photographers but make sure that what you do is different and unique. There are some really great tips and advice in my book on Masters Guide to Wedding Photography. Some photography schools are now using it as a textbook. What would be the top 3 elements new photographers breaking into wedding photography should prioritize? A style: you have something unique to what relates to what you do. The way I photograph suits me personally and it’s an extension of who I am. Clients are getting someone who’s approachable, easy-going, caring, understanding. Personality and being able to relate: people are attracted to your style and the photography you create—as soon as they meet you, you as a person is probably the most important thing to them then. Experience you offer: look at every aspect you do and be exceptional in every way so you stand out because that’s what people want. Have a desire to deliver your best to every client without exceptions or excuses. Do the unexpected at every opportunity you can. When someone walks into our studio, they get a welcoming smile, a nice aroma from the scented candles, the personal nature of the staff. They also get quick replies to emails. We have so many clients come in here saying, you’re actually one of the rare photographers who actually returned our email at all, let alone within 24 hours. For that client, that’s an experience that they actually get return email. It has to be backed up by providing them the most amazing wedding images and wedding album that they are going to want to share with their friends and family. These three elements are fundamentals of every successful wedding photography business or any business in general from a service point of view. They make you more marketable. Do you review images you took 10 years ago? I saw one of my first bridal images I took 10 years ago in an ad, I would use those same exact images in an advert today. It speaks exactly of what I do as a photographer and that recording and capturing of these moments. My style really has lived the test of time because I’m not trying to be what’s in fashion today, it’s more a classical style I inherited. I’ve ingrained that classic feel into my work. What’s so special about what I get to do is building relationships with clients. It’s priceless to have that repeat business and referrals. Having values and setting those values from the very first year of business has been key for building these relationships with our clients. It’s consistent. We’re photographing additional events because of connections that were made 6-8 years ago. We made such a great connection then, and when the opportunity arose, they immediately thought of us. Do you have some goals for where you’d like to see yourself in a year? I’m getting to do some amazing weddings that I feel very privileged to do. The couple I just photographed in Bali last week is from NY. We were talking on Skype and via email and they’re, a most amazing couple. So interactive with each other, so in love, and for me it was such an effortless thing to be able to capture that relationship—it’s what I do best. When potential clients see the images on my website, they see images full of emotion and story. They see a little of themselves in those images and is one of the reasons why they hire me. And that sort of makes me have the dream job. If I could just keep doing that, I’d be the happiest man around. The most important thing is to follow your passions, if you’re working 80-hrs a week, you’re doing exactly what you love to be doing. Do you tend to see in B&W—are you thinking in B&W when you’re composing an image? Not really, but I do try to see the final image when I shoot it. This will be a big thing for photographers in the coming years. In the last 10 years, there’s been a loss of skill sets for photographers. Even for me, there are skills I don’t have that photographers in the 60s, 70s, 80s definitely did have—understanding of posing, lighting, those values have been lost and started to erode over the years. With more sophisticated cameras, a client has to differentiate themselves from fellow photographers, they also have to differentiate themselves from consumers as well. The level of what consumers can produce as a product themselves is phenomenal. We’re going to see a revival of skills in industry and I predict photographers will start to differentiate themselves in the marketplace once again. It’s definitely why we are playing with on-location studio lighting, refining our skills even more with digital processing, the digital presentation, looking for new options all the time. I’m continuing to learn as it keeps me interested and excited. I can take everything I’ve learned over the past 10 years, while still learning new skills, and then going in new directions and that’s really refreshing for me. What are some tips you would offer to photographers who want to get into wedding photography? Try to get with an organization, like photo.net, Digital Wedding Forum, maybe your local WPPI and PPA, each region has professional bodies that open up incredible networks where you can learn info and make friendships. Get into contact with local photographers and see if you can assist and follow what they do. You don’t have to do the whole business yourself. You can narrow it down and work out what you really love to do. Look for a job at another studio doing those tasks or aspects that you love—whether it’s digital retouching or shooting. It’s too common where photographers feel like they’re isolated, and think they have to do the whole business themselves. There are opportunities to connect with other photographers and work with studios. I was taken under the wing of a great photographer in Australia who taught me how to darkroom print and it was about communicating the message about lightening and darkening images. When I started getting into digital about 5 years ago, I took those ideals. I’ve always believed it’s so important to communicate your vision, not just what you’re seeing behind the camera at that time, but your whole idea about that scene and story, and communicate that into a beautiful fine art print. We live in an electronic world. A beautifully crafted image is a work of art no matter if it’s seen on a laptop, flat screen, album, or on the wall. The photographer really needs to understand how to produce a work of art. Photographers should want to see themselves more as a photographic artist and can separate themselves in the marketplace, and provide their clients with something magical and beautiful as well. Text ©2010 Marcus Bell and Hannah Thiem. Photos © Marcus Bell. I found it a bit self praised. Being a renown tog, Bell doesn't really need to compare himself to "other photographers" in a pejorative way. Makes it sound so easy. But it reinforces the fact that a good photographer needs confidence in his or her technical skill and can concentrate on looking for the "moment". That has never changed since the first cameras were made.